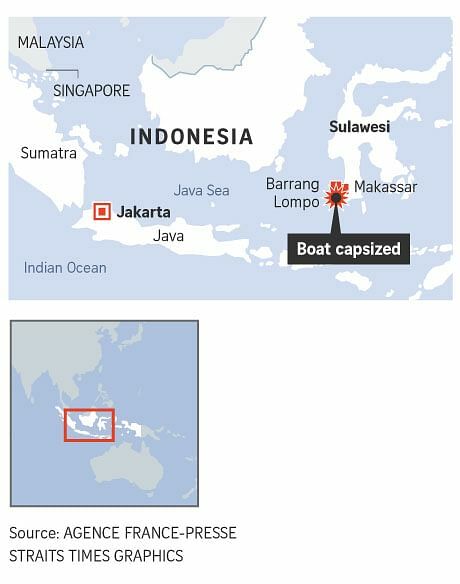 JAKARTA (REUTERS, AFP) - At least 15 people died when two boats sank in rough waters in Indonesia on Wednesday (June 13), the authorities said, and rescue workers scrambled to search for dozens believed missing. Ferry accidents are common in Indonesia, a vast archipelago, especially during the Islamic holiday of Eid, when millions make the annual journey by land, sea, and air to their home towns after the holy fasting month of Ramadan. In the case of the accident off Makassar, the packed traditional wooden boat – known locally as a jolloro – left the provincial capital of South Sulawesi in the afternoon for a short journey to the tiny resort island of Barrang Lompo, about 15km north-west of the city’s coast. “The boat reportedly hit a large wave amid bad weather and capsized,” said local disaster agency head Amiruddin, who like many Indonesians goes by one name. Makassar police chief Aris Bachtiar said the boat was overloaded. “We are still investigating,” he said, adding that the captain had been detained. Basarnas, the search and rescue agency, said that a one-year-old was among the dead. The authorities including the Indonesia search and rescue agency, police, and military deployed speed boats and dozens of personnel to search for survivors. "We still don't have clarity on how many survived... as the search is still ongoing," said Mr Toto Mulyono of the Palembang search and rescue office in South Sumatra dealing with the speedboat. Mr Amiruddin of the national search and rescue agency in Makassar said 22 people had been rescued there.